The New Jersey Devils seized control of the Eastern Conference finals, using Ryan Carter’s late goal and an empty-netter by Zach Parise to beat the Rangers 5-3 and take a 3-2 series edge. 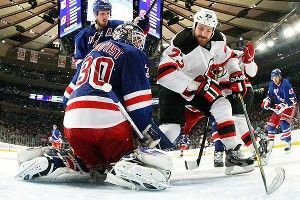 Before he skated off the ice, Rangers goalie Henrik Lundqvist told the Devils that a ghost goalie was taking his place, and that anyone who scored on him would be killed in their sleep. As of press time, Parise was pacing through Jersey City in a bleary-eyed panic, blasting heavy metal on his earphones and slapping himself in the face every few seconds. Jrue Holiday scored 20 points as the Sixers beat the Celtics 82-75 in Philadelphia to force a Game 7 in the Eastern Conference semis. “Yay!” said Matthew Smith, the president and founder of Mundane Imbeciles Lobbying Quaintly, Using Electricity, To Oppose Anything Slightly Titillating. Experts interpret his mild enthusiasm as evidence that this series is really boring. Also, bad job by Smith of throwing in the pointless “using electricity” just for the sake of the acronym. Really weak. For their hard fouls against the Pacers in Game 5, the NBA has suspended Udonis Haslem for one game and Dexter Pittman for three. In an unprecedented move, David Stern also suspended Tyler Hansbrough for being “soul-crushingly awkward” for two games. “We had to try something,” said Stern. Cole Hamels pitched eight scoreless innings, allowing four hits and striking out eight, to beat the Nationals 4-1 and earn his seventh straight win. “One more and you’ll have a win for every day of the week!” said Phillies closer Jonathan Papelbon, who just learned how to tie his shoes. A-Rod jacked two home runs off rookie Will Smith to end a long homerless drought and lead the Yanks to an 8-3 win over Kansas City. “Here come the Men in Blaaacckkk! !” sang A-Rod as he rounded the bases, performing a dance routine that Joe Girardi literally begged him not to do. Lance Lynn recovered from a poor first inning to earn his seventh win of the year, and Carlos Beltran bashed his 14th home run, as the Cardinals beat the Padres 6-3. “Other than peeing myself on TV during that first inning, great night!” said Lynn, still proudly wearing his soiled uniform hours after the game. Joe Saunders scattered seven hits over 6.1 innings as the Diamondbacks ended the Dodgers’ six-game winning streak with an 11-4 shellacking. “We felt a lot more mobile without the old uniforms that had actual diamonds encrusted on the back,” said D-backs slugger Justin Upton. “Don’t get used to it!” shouted eccentric Arizona owner “Diamond” Ken Kendrick, who plans to unveil a diamond-lined jock strap this weekend. The NFL Players Association filed a federal lawsuit against the NFL, accusing the league and its owners of colluding to set a secret and illegal $123 million salary cap in 2010, an uncapped year. “Should we secretly revoke the cap?” asked Saints owner Tom Benson, in an emergency owners meeting. “Do two secrets cancel each other out?” When he was met with dumbfounded stared by the other owners, Benson became uncomfortable. “I’m not a lawyer!” he shouted.